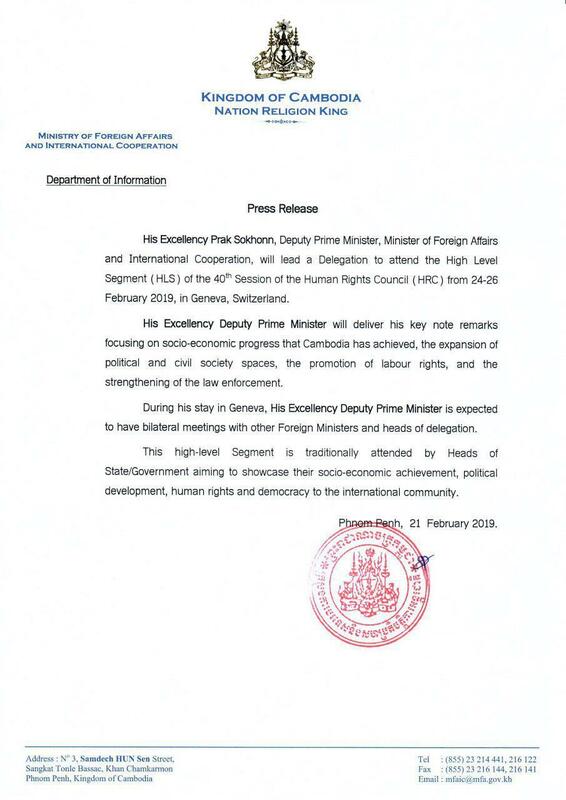 Phnom Penh (FN), Feb. 21 - His Excellency Prak Sokhonn, Deputy Prime Minister, Minister of Foreign Affairs and International Cooperation, will lead a Delegation to attend the High Level Segment (HLS) of the 40th Session of the Human Rights Council (HRC) from 24-26 February 2019, in Geneva, Switzerland, according to the ministry’s press release dated Thursday. ​“Minister Prak Sokhonn will deliver his key note remarks focusing on socio-economic progress that Cambodia has achieved, ​the expansion of political and civil society spaces, the promotion of labour rights, and the strengthening of the law enforcement; and is expected to have bilateral meetings with other Foreign Ministers and heads of delegation,” the statement wrote. “This high-level Segment is traditionally attended by Heads of State/Government aiming to showcase their socio-economic achievement, political development, human rights and democracy to the international community,” the statement added.